But isn't that just what HelpHound is always saying we should do, we hear you ask? No - not exactly. Over time a strange pattern has emerged when we look at certain types of business (commonly restaurants and pubs). That pattern is as follows: businesses that actively invite reviews - usually by handing the customer a card - get proportionately more bad reviews than their competitors who don't. 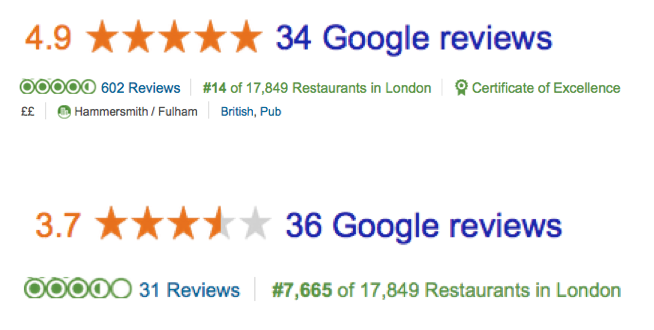 Inviting reviews is harming their business. Why? It's plain human nature again: your guests are more likely to hang on to that card asking them to write a review if they had a poor experience. It's as simple as that. We know both of these (they're just around the corner), and they are both great pubs. Which one do you think is packed at lunchtime? As ever: is Dialogue. Don't hand out cards for the diner to take home - ask the diner(s) for their email addresses at the table*. Then invite them to write their review direct to you. Dialogue enables you to manage any negatives in private and then get those great reviews to sites that matter. Job done. *Some are initially reluctant to do this; it's simply a case of how you ask. The best solution is to say 'We'd like to keep in touch with news and special offers' and then leave it to the guests to complete the card. The advantages of this strategy (besides review harvest) are too great to ignore: getting all guests' contact details (not just the host/booker) for future marketing being the main one.